Two weeks ago, as we all heard the news, Leonardo DiCaprio finally took home that little golden statuette. He received his first Oscar nomination in 1994. He earned it for his performance in “What’s Eating Gilbert Grape”. And actually, this movie is one of my all-time favorites. Have you seen it? It’s a great movie, definitely worth watching. I watched it time and time again and I feel like watching it again. Just in case. 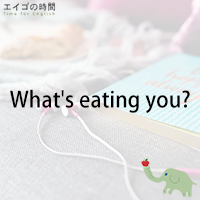 Are you familiar with the expression, “what’s eating you”? It’s not about food. It’s not that you are eating something but that something is eating you. This phrase is asking someone who looks depressed or upset why they are not happy. What is worrying you or annoying you? What is bothering you? What is troubling you? Tell me why you look so depressed or upset. Now, why don’t you try a quiz? I’ll give you three options and you’ll choose the one that is TRUE. Ready?